This Katrina show began in the shower room at the Austin Convention Center. Abe Louise Young was volunteering there when she realized that the people she was helping bathe wanted to tell her what had happened to them and talk about who they were almost as much as they wanted that hot water. This collection of pieces demonstrates the way that culture survives, transforms, and tries to heal itself in the aftermath of disaster. The focus is not just on mainstream cultural expressions, but also on the grassroots, the underground, the rough around the edges. We hear from a Mardi Gras Indian chief, school kids in a housing project, a Voodoo sorcerer and t-shirt vendors in the French quarter. There are thousands more stories out there and hundreds of groups collecting them. 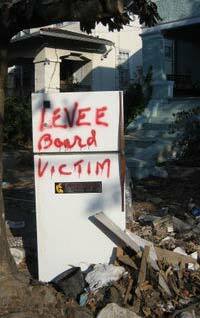 Perhaps after the taste you’ve had here, you’ll want to hear, do or see more so we’re posting links to people and groups who are collecting Katrina stories on tape, on film, on the stage. Being a New Orleanian now means being completely neurotic about diplomacy and representation – always trying to strike the perfect balance between reminding people of the abyss of sadness and fear in our city and of all the romantic reasons we are worth saving. I was worried that these recordings, made very shortly after the storm, wouldn’t do the latter job adequately, but they still represent my impressions a year later. I interviewed my friend Abram Himelstein in a vaguely soundproof lean-to (dubbed the radio shack) that my boyfriend built for me out of salvaged lumber from our damaged house. The shack occupied half of the sole livable room during the reconstruction of our home. Elmer Glover is a voodoo sorcerer and resident of New Orleans. He left the city when the storm hit land a year ago but was drawn back in spite of losing his business. In New Orleans strangers talk to each other. I was raised in the affectionate, gregarious call-and-response that flows between strangers black and white on the streets of New Orleans. The city’s background noise is narration; it’s a palette of baby, sweetheart, how y’all doing, hey my love, your feet hurt. As a child, I learned to nod, smile, and say “How you doing?” to every person I encountered, black or white—and then really listen to their answer. I don’t live in New Orleans anymore, I live in Austin Texas. But last summer a whole lot of New Orleans came to Austin. 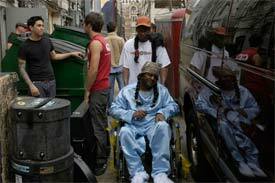 I started as a Red Cross volunteer at the shelter for Katrina evacuees in Austin, Texas. I’d been there for about 72 hours, working in the outdoor showers, when something hit me. I realized that when 5,000 people who’ve just lost their homes, communities, and family members arrive in a new town, tending to their stories is just as important as tending to their bodies. There were a lot of people who had a lot of things to say and we were there to hear them. We were present at the Austin Convention Center every day and night until it closed. After everyone left the shelter we kept recording through word of mouth and we’re still recording today. You are about to hear some of the stories that we’ve collected. 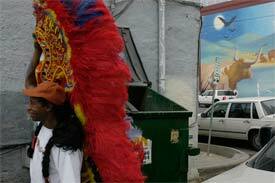 When I met Big Chief Kevin Goodman head of the Flaming Arrows Mardi Gras Indian tribe, he was wearing his bright orange feather suit, the costume that he’d sewed by hand here in Austin after his old one was destroyed in the flood waters. Producing these “Alive in Truth” pieces was a bit of a technical challenge because the oral histories were recorded by a wide range of people, some with technical audio experience and some without. The richest part of this experience for me was the collaborative nature of this project. Even throughout the radio production process Abe managed to keep me (all the way in Woods Hole on Cape Cod) connected to the folks in Austin and Houston whose stories we were telling. The intensity of this kind of collaboration makes the process more complicated but also more rich. Sarah Yahm has tried out various careers before settling into radio documentary. For the past year she’s been living in Woods Hole, working at Atlantic Public Media and Transom as a producer and editor. She’s moving to UC Santa Cruz to start a graduate program in social documentation. Heather Booth is a graduate of the New School. She is a longtime resident of New Orleans and program assistant at American Routes. Alexandra L. Woodruff has produced and written for commercial television news stations in Salt Lake City and Oakland for the last nine years. She has spent most of this year trying to redeem her public radio soul. She spent the summer reporting for KNAU, the National Public Radio affiliate in Flagstaff, Arizona. She’s currently working on a Masters of Journalism at U.C. Berkeley’s Graduate School of Journalism. Eve Troeh is a radio producer and reporter who’s lived in New Orleans since 2000. She’s the former Editor of PRI’s American Routes, and since Katrina has been filing for any number of public radio outlets. Eve was just named a Katrina Media Fellow by the Open Society Institute, so she’s looking forward to another year of reporting on the rebuilding of New Orleans. Abe Louise Young is a poet, educator, and activist born in New Orleans, LA in 1976. Her poems and essays have been published and anthologized widely, and she edited the anthology, Hip Deep: Opinion, Essays, and Vision from American Teenagers (Next Generation Press, 2006.) As founder of Alive in Truth: The New Orleans Disaster Oral History Project, Young also works to document the lives of Hurricane Katrina survivors living in Austin. Riza Falk lives in Greeley, CO and works as a photojournalist for the Spanish language weekly La Tribuna. She earned her M.A. in Photojournalism at the University of Texas at Austin where she shot an in-depth documentary project on the Flaming Arrow Mardi Gras Indians from New Orleans. More of her work can be found at rizafalk.com. Anniversaries draw our attention to what we should be paying attention to all along, but life is crowded after all. After Katrina, we began to hear more and more at Transom about grassroots stories of the storm and its aftermath. One of our editors, Sarah Yahm, decided to compile them, because they were being told anyway, regardless of who was listening. We hope you’ll take a moment, now or later, to listen to a few more stories from people who needed to tell them. This is an incredible intervention into the social archive: the multiplicity of voices and multiplicity of experiences, all arching matter-of-factly toward this shared memory of a trauma made all the more impossible by its having become a contuing, quotidian, lived reality for over a year now…I am more moved by this piece’s enactment of polyphonic and particulate revenance than I would be by streamlined Grand Narrative. This particulate revenance is, I think, encouraged and facilitated by the overall silence of the interviewers and the implicit energy they’ve devoted to editing their materials; the stories seem to emerge from within and of their own accord, rather than being called forth from without. Thank you for these eloquent, angry, poignant, disturbing, and beautiful stories. They were so intimate and revealing. For any of the producers: what were the biggest challenges in working on these stories? Are there things you left out that you wished you could have included? Has anything surprised you about people’s reactions to the stories? The diverse images and perspectives offered by Sarah, Heather, Alexandra, Eve, and Abe do a memorable job of reminding that Katrina, while a year past, is alive and well. I appreciate the raw voices and commentary. I was laughing with the Kitsch story until I hit the moment with the children quoting the rap F Katrina. I have to say, unfortunate an explicative would keep that moment off a broader airwave, it encapsulated for me what is at stake in N. Orleans and what many struggle to acknowledge. As the reporter acknowledges herself, F Katrina is jarring, yes, but it happens to be the verbal shoe that fits the proverbial foot perfectly. I found myself wanting to say it by the end of the story. I unfortunately have the image of Geraldo burned into my mind in conjunction with Katrina, when he grabbed a baby out of a womans arms and started pleading for something to be done. The Geraldos are long gone, but as you demonstrate in your voices and your exemplary work, the problems of N. Orleans are not. I feel sometimes Anniversaries can be detrimental as they focus emotions on a day, or week, but rarely in a sustained manner of support. How do you market voices like you have to a public who might be showing symptoms of story fatigue? they have heard so much already. How do you keep the information fresh and relevant and convince the public to tune in? And how do you convince them after a year that this is not simply advocacy journalism? 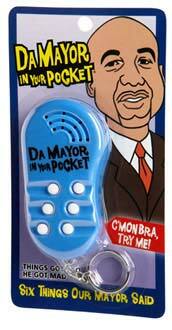 That it is relevant to people outside N. Orleans too and that they should care to listen to these voices? Thanks for opening my ears to the current reality of New Orleans. Now that the anniversary has passed, I think those of us here wonder if the "Katrina" label on our future work will be the kiss of death. For me, I want the "Katrina" pressure off, completely. In the way that every story with a New York dateline isn’t a 9-11 story, I want the New Orleans dateline to simply stand for a fascinating and complex cultural, political and social landscape. I think to keep an audience interested now, you have to talk about how things functioned – and dysfunctioned – here before Katrina. You have to make New Orleans *the* touchstone for the ongoing story of race, class and culture in America. That’s the relevance. That’s the real fallout of the storm. And that’s what will keep people listening. Hey Elizabeth. My biggest challenge producing these pieces was about letting go of tape that was moving and powerful but just not broadcast quality. There were some incredibly moving and powerful moments where a bunch of evacuees sat around and talked and argued about the aftermath and I really wanted to find a way to present those intimate moments to the public. But they just hadn’t been recorded well enough. So for me the major challenge was to find a way to use the tape that was more polished without losing the raw intimate feel. this was the first time I’d produced from tape that other people had collected. (i collected some of it but most of it I didn’t) and I realized you have a very different relationship to tape that you haven’t collected yourself. Equally intimate but different. I thought i would have more perspective about what tape was usable because it wasn’t "mine" but I very quickly developed the same lack of perspective I have towards tape I have collected myself. It was strange to create these intimate portraits of people I hadn’t actually met. That’s what was so great about working with Abe. She kept me honest and kept me in touch, indirectly, with the people that I was documenting. I think most people give lip service to working collaboratively with their subjects but Abe really does it. she would play drafts for Big Chief Kevin goodman and second Chief Kevin Bush and then give me the feedback. The integrity of the process helped me really stay on track and kept me honest. Thank you for the insightful and considered responses. One of the most important things I learned through working on Hurricane Katrina-related documentation is that so many of the most vulnerable evacuees, who emerged (?) from the deep poverty of New Orleans, do not live in a text-based world. They’ve had no control over how they were represented in the media–before or after the storm. About a third of the folks I’ve interviewed do not read and write comfortably–conversely, they are true champions of the verbal art. The context of meaning-making in their lives–as far as I understand–is social, familial, musical, and cultural. In the absence of textual literacy, going back to narrators with "transcripts" is impossible. In my interviewing process, I discovered that it was critical to let narrators hear their own voices recorded, and hear the recorded voices of other survivors. This created a transpersonal context for understanding their experience, and often deepened and broadened what was said. When playing excerpts of other evacuee’s interviews to each new evacuee I met with–suddenly, there was a context for their story to surge out, struggle, and connect in relationship to. They were in a sense "talking" to the other people who’d offered story–and that was very different from talking to me, a white woman who (no matter how sentimentally attached to the city) left New Orleans ten years ago. This was a beautiful, fascinating process to observe. The making of this show involved working intently to keep the narrators in the loop of their representation. For example, Sarah had to make a choice about how to represent interactions with police. There were so many negative experiences on tape to draw from–and a few positive ones. So, we asked the people talking: is it important to show a balanced view? Several hours of debate in the middle of the night emerged from this question. No resolution was found, everyone agreed upon their desire to have a moment of hope at the end, to give strength to other evacuees who might be listening. To me, including narrators in the making of the final story is as important a step as recording the original tape. Sarah Yahm is a genius at allowing a story to evolve over time, and her openness to this often slow and zigzag process made a kind of integrity possible that I think we’re both surprised about and proud of. The public and private emotional experience of Hurricane Katrina is going to continue to detonate over the many decades. A key to understanding the evacuee experience is in Kevin Bush’s words, which unfortunately were recorded too poorly (on a windy porch, in a large conversation). He said that the black people of New Orleans were made to feel like Hurricane Katrina was *their* fault. Now, in the vacuum of true aid or resettlement, that feeling is amplified. These emotions are something that I think our country has to hear, and address– even if it is "the kiss of death" to demand we focus–for as long as it takes– on the painful truth. Thank you for listening, and for this conversation. Blessings to all.